From our base in the historic town of Ronda, we travel in all directions of the compass to explore the different landscapes of mountain and valley which surround the town. This celebrated region of natural beauty sits within 3 designated Natural Parks and offers a mix of dramatic limestone mountains and gorges, acres of holm oak and cork forests, olive groves, vineyards and winding river valleys. Dotted between them are some of Andalucia’s prettiest white villages, many of them having changed very little for hundreds of years. Cycling off road takes you to the heart of this landscape, experiencing its tracks and trails at close quarters, riding past remote farms and through unspoilt countryside to give you a taste of truly rural Spanish life. There are some challenging climbs to tackle but you are rewarded with great views at the top and, of course, long descents. Arrival. Transfer to Ronda and your hotel. Bike set up ready for next morning’s start. Your hotel is located in the heart of Ronda, close to all the local sights and amenities. Inclusive dinner at your hotel. 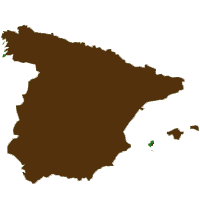 Ronda to Coripe ( 72 km; 1100m ascent; 1600m descent) Today we ride through the rich agricultural land directly north of Ronda, passing olive groves and vineyards which produce some of the best wines of the region. During late summer we will see fields of sunflowers as far as the eye can see, creating a bright yellow carpet across huge expanses of these hillsides. We visit the village of Setenil de las Bodegas, famous for its cavehouses, set into the huge limestone rocks and still in use today as homes, cafes and shops. We pass through Torre del Alhaquime and on to the ancient hilltop village of Olvera, a human settlement for more than two thousand years. Its long history has left it with an impressive, almost cathedral-sized church, an Arabic castle, perched on a high rocky outcrop and sections of ancient city walls. From Olvera we drop down into a valley, where we follow a disused railway line, passing through tunnels, over viaducts and past a Griffon vulture colony. Return to Ronda by minibus. Evening free to dine out at your choice of local Ronda venue. Ronda to El Chorro gorge (60 km; 1700m ascent; 2200m descent) Today we explore east of Ronda, using parts of the well-travelled GR7 route, combined with remote trails. Most of the day’s riding is in open countryside, dotted with farms and isolated houses; a real taste of rural Andalucia with far-reaching views across the rolling hills and mountains. The ride includes a steep climb over the mountains of the Sierra de Aguas before descending via a steep-walled, rocky valley down to the base of El Chorro. Here we see where the river has carved through the limestone to form the dramatic El Chorro gorge, rising 200 metres high but only 3 metres wide at its base. We see the aqua blue waters of the 3 lakes of Guadalhorce – Guadalteba and the dam inaugurated in 1921 by King Alfonso XIII, which controls the flow of these rivers down into El Chorro gorge. After freshening up, we dine at one of our favourite lakeside restaurants before returning to Ronda. Tolox to Ronda ( 53 km; 2400m ascent; 2000m descent) Today we ride through the heart of the Sierra de las Nieves, a vast, unspoilt Natural Park lying to the east of Ronda, with no roads, only tracks and trails. We ride through pine forests and dramatic limestone mountain ranges, over high peaks with views to the Costa del Sol and down into deep, rocky valleys. We pass the foot of the highest peak in western Andalucia, Mount Torrecilla (1,909m) and finish with a 13km downhill right into Ronda itself. Inclusive dinner at your hotel. Explore Ronda. Free to explore the town by yourself. Optional half day self-guided ride which takes you to local high spots for the best views of the gorge and town. Evening free. Ronda to Estepona ( 64 km; 2250m ascent; 3000m descent) Today we ride southwards, from the mountains to the sea. We pass through the heart of the Sierra Bermeja, riding through pine forests and along rocky mountain passes. We visit the unique “Smurf blue” village of Juzcar, then descend over 25km right down to the resort of Estepona on the coast. Spend some time on the beach or at the marina. After time to freshen up, we dine at the marina, beside the boats and luxury yachts, before our drive back to Ronda. Grazalema to Jimera ( 59 km; 1500m ascent; 2000m descent) Today we head to the Sierra de Grazalema, which lies west of Ronda, to experience more of the best mountain biking in the region. We enjoy long, technical descents, lots of singletrack and superb cross country trails, with points of interest along the way. From the mountaintop white village of Grazalema, we ride down through cork forests, on singletrack and trails to the white village of Montejaque. We ride past the abandoned Hundidero dam – an 85m high dam which sits in a valley but remains bone dry for most of the time! – and descend to the “Cueva del Gato” (Cat Cave). Then, using the river as our guide, it’s more singletrack, undulating through the river valley to the village of Jimera. A climb takes us up to a mountain ridge, with views over the Genal Valley, across to the Mediterranean and Gibraltar. We finish with a great descent into the Guadiaro valley, to arrive back at Jimera for our minibus ride home. We spend your final evening dinner in Ronda. Return to Malaga airport for flights home. From March to December. Choose your date ! Single room available on request. This boutique hotel is really central and just 2 minutes walk away from Ronda’s famous bridge. The small staff team are extremely friendly and helpful and make any stay here very special. Access Point: Malaga airport. The largest airport in Andalucia and gateway to the Costa del Sol and Andalucia’s mountain interior. Frequent flights from almost every UK airport (even the small ones) and most major European airports. Malaga Airport transfer to and from Ronda is included in your holiday price. English speaking, British Cycling qualified guide. Rides average 60km per day. Requires off-road mountain biking experience.